Please select your ship-to location. 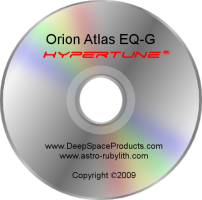 This 2-disc DVD set goes through a step-by-step process HyperTuneTM the Orion Atlas mount and is applicable to the EQ-6 and CGEM mounts as well. Running over 2 1/2 hours every process is shown in detail with excellent professional advice. This DVD also includes the do-it-yourself Latitude Adjustment Modification (does not apply to the CGEM) which enables user to have fine control on the latitude adjustment. DVD run time: 2 hours 55 minutes. Please note that shipping for HyperTune DIY products within the continental United States ("CONUS") is by USPS Priority Mail. International/Non-CONUS shipping is either by USPS Priority Mail International (which has no tracking available and can take more than a month due to customs) or USPS Express Mail International (which includes tracking and generally takes a week or less). For anyone planning to HyperTune the Atlas/EQ6 mount, it is highly recommended that you also purchase the Worm Gear Retaining Ring Removal Tool along with the DVD. The tool can be found here on this link.